This post is sponsored by Plaid Crafts. All opinions are my own. 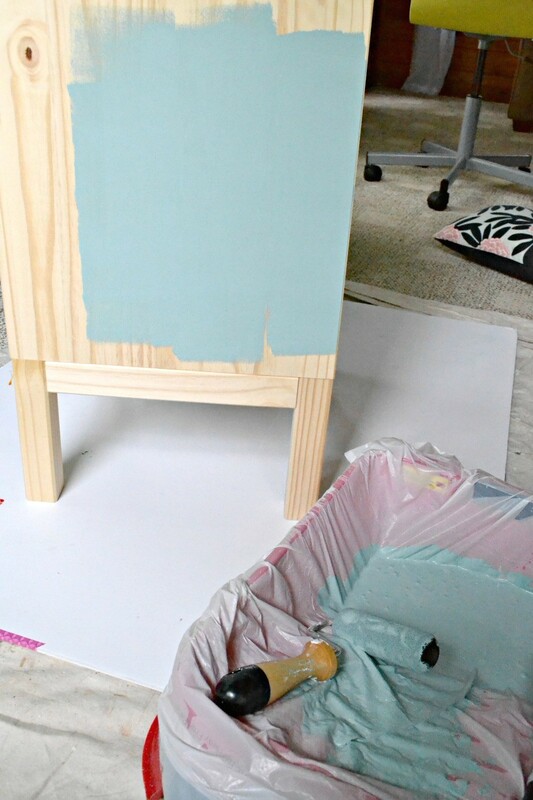 I love trying to personalize and reinvent every day items, especially furniture! 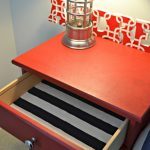 Today I’m teaming up with Plaid Crafts as they challenge us to take a standard IKEA Tarva Nightstand and reinvent it into whatever style we like. 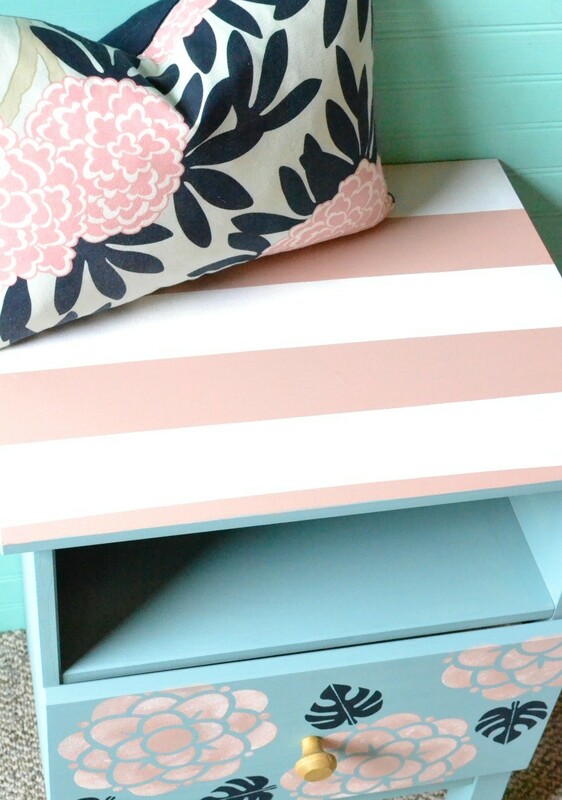 I used FolkArt Home Decor Chalk paint® for my project and went with a Caitlin Wilson inspired nightstand makeover. Not familiar with Caitlin Wilson? She makes gorgeous fabrics, pillows, and home decor that I use in my own house, so I thought it would be fun to do a piece inspired by her trends. 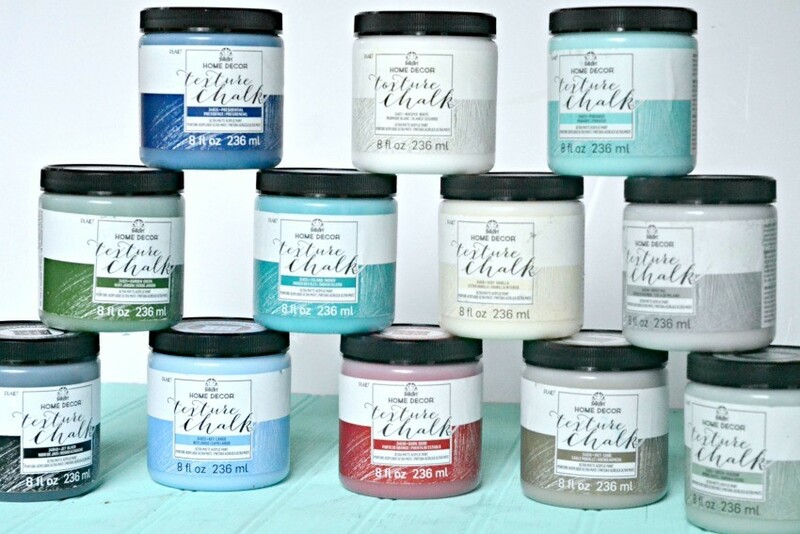 I love the FolkArt® Home Decor™ Chalk paints for this project because this is a no-prep acrylic paint and wax that dries in minutes and can be layered and sanded to give your projects the perfect distressed look and feel. There are eight new awesome colors as part of this line, so now you have even more options to choose from! The ultra-matte chalk finish can be easily applied to furniture, cabinets, walls, decorative glass, metal and more. 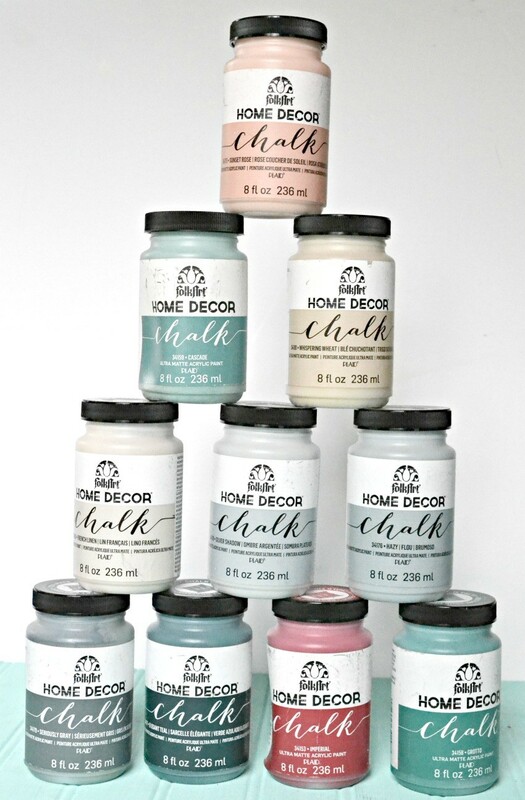 The FolkArt® Home Decor™ Texture Chalk is equally as awesome because it comes in 12 colors and you can easily achieve that coveted “old world” vintage feel! The thick, textured paint adds dimension to any project surface that can be layered, distressed, glazed, and waxed to create a time-worn look. The water-based, non-toxic paint requires minimal surface prep and dries to an ultra-matte, chalk-like finish. 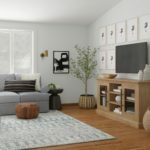 It’s the perfect product to use on a project like this, so let’s get started! 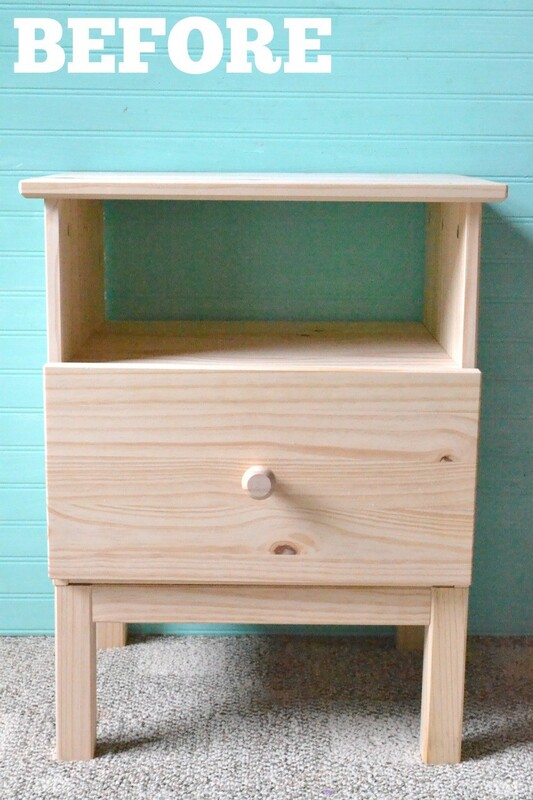 You start by assembling your Tarva nightstand, which takes about 2.5 hours or less to put together. 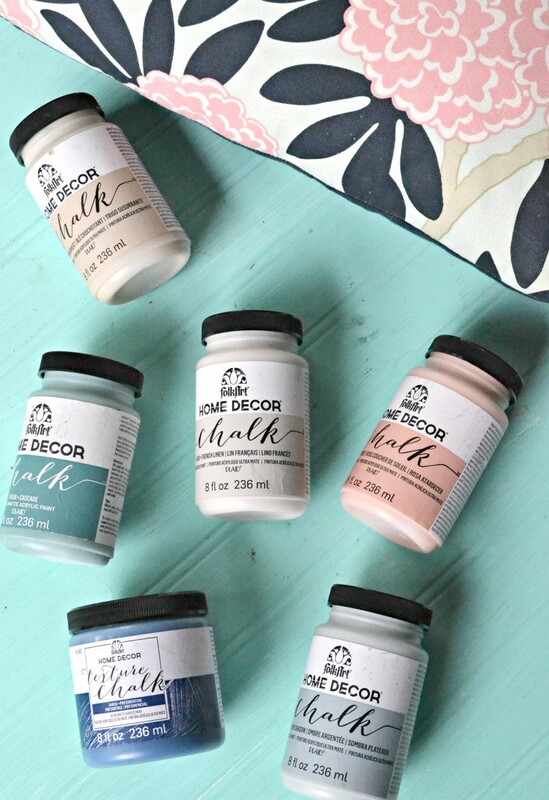 Next up, I mixed together FolkArt Home Decor Chalk Paint in Cascade and Silver Shadow to make the base color of the paint. The teal of Cascade and the gray of Silver Shadow mix together to create the perfect color for this project! That’s the great part, if you don’t have the perfect shade you need, don’t forget that you can combine colors to get the right color! 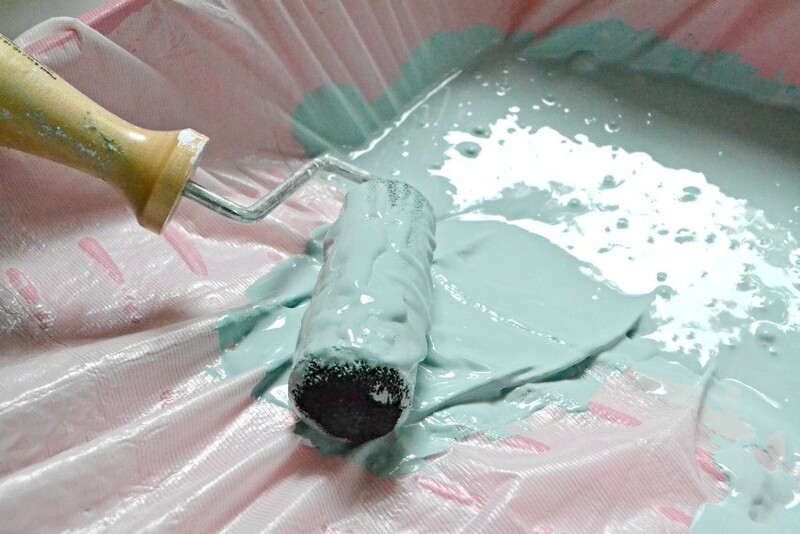 Painting Tip: Take a standard painter’s tray and cover it with a trash bag, then put your paint in it. This makes clean up SUPER easy later on! 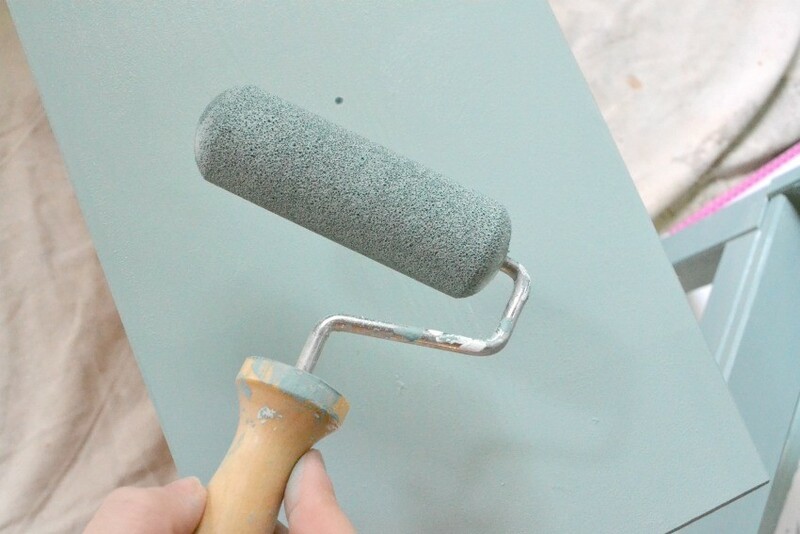 Apply a generous base coat to your dresser using the FolkArt Roller and then let dry completely. 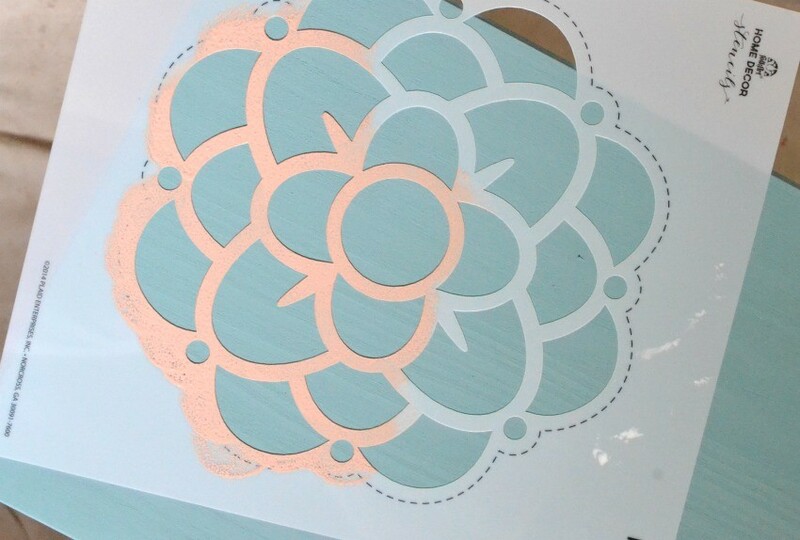 Once dry, you can get started on your stenciling!! 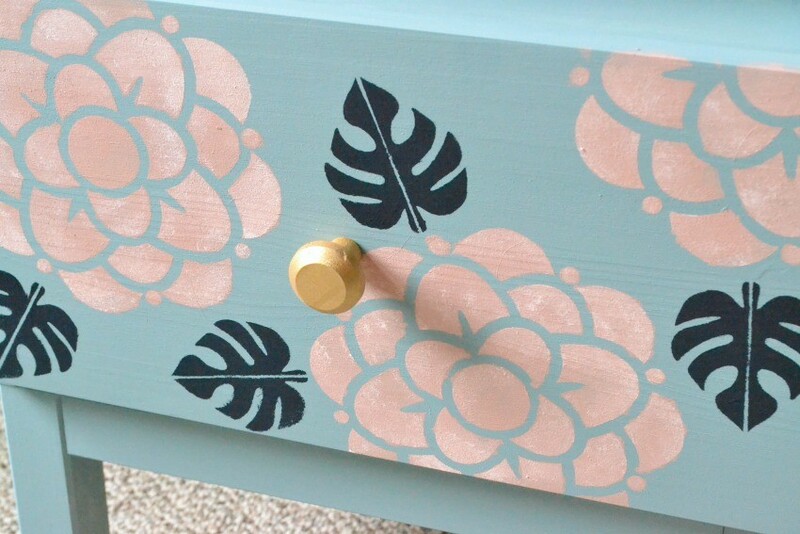 I used the FolkArt Camelia and Folk Art Tropical Leaf stencil for the drawer. 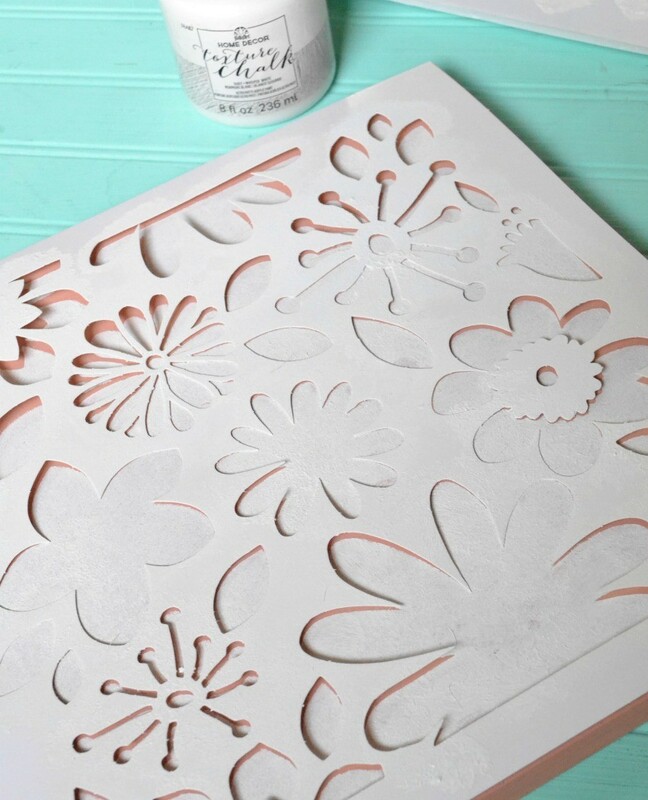 For the flower, I stenciled on the flower using FolkArt Home Decor Chalk Paint in Rose and Whisper White. 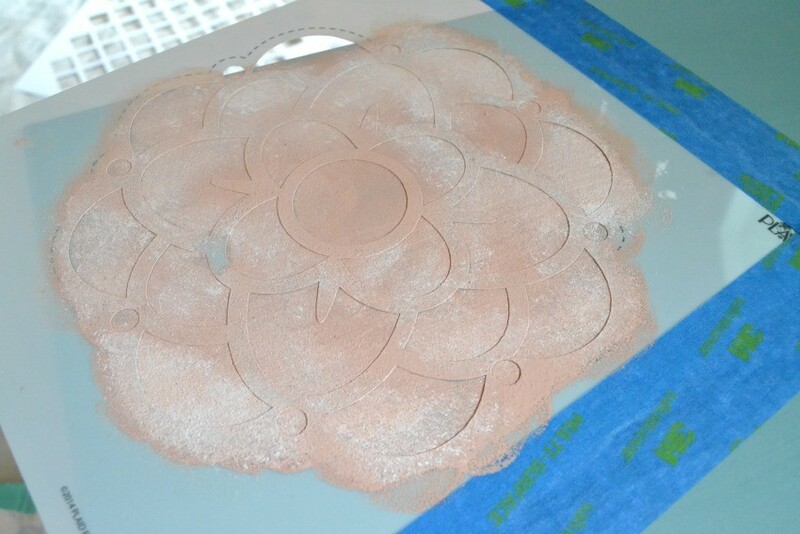 I stenciled the flower on first using the Rose, then gently dabbed some Whisper White onto the edges and blended in. 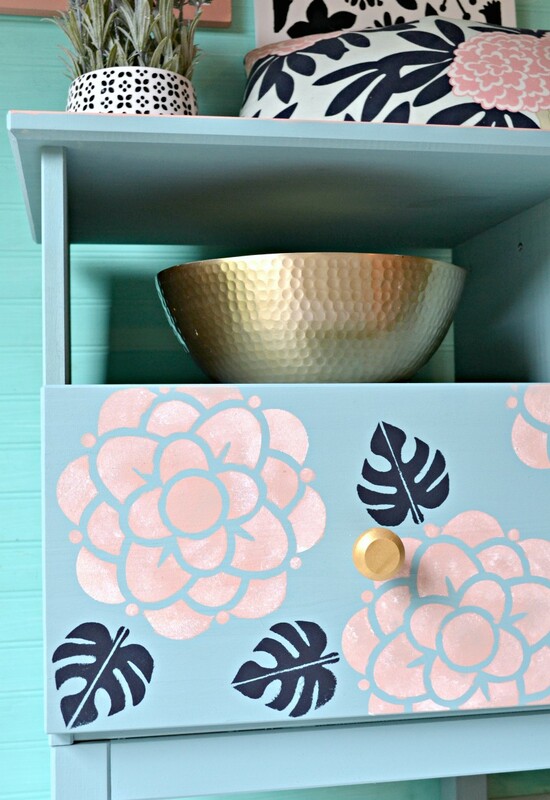 After the flowers were on, I stenciled on the leaves using a combination of the FolkArt Home Decor Texture Chalk Paint in Presidential + Jet Black. This creates a deep, rich navy blue color! 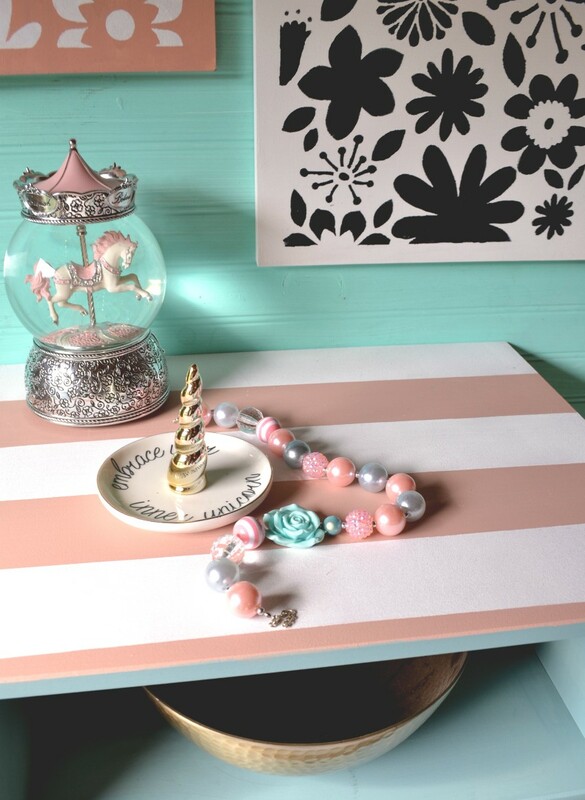 Finally, using my painter’s tape, I taped off 3″ lines and painted the top of the dresser with pink and white stripes using the Rose and Whisper White again. 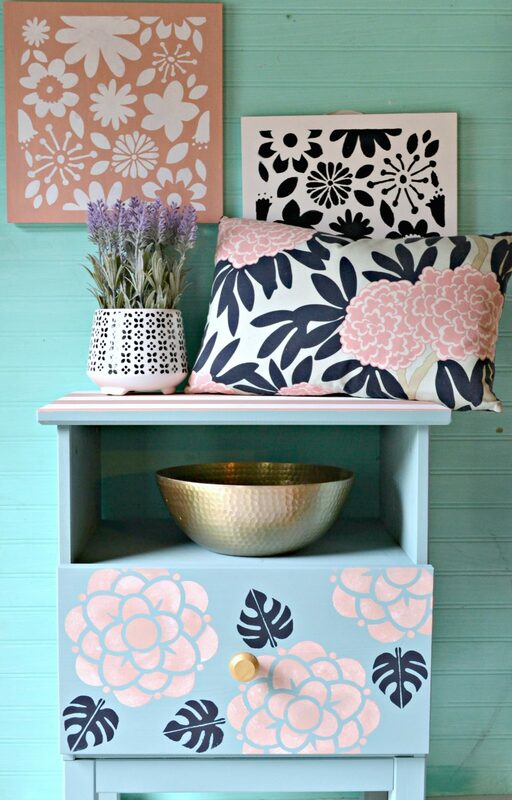 The next step is to create the two floral signs that I hung over top of the nightstand…. 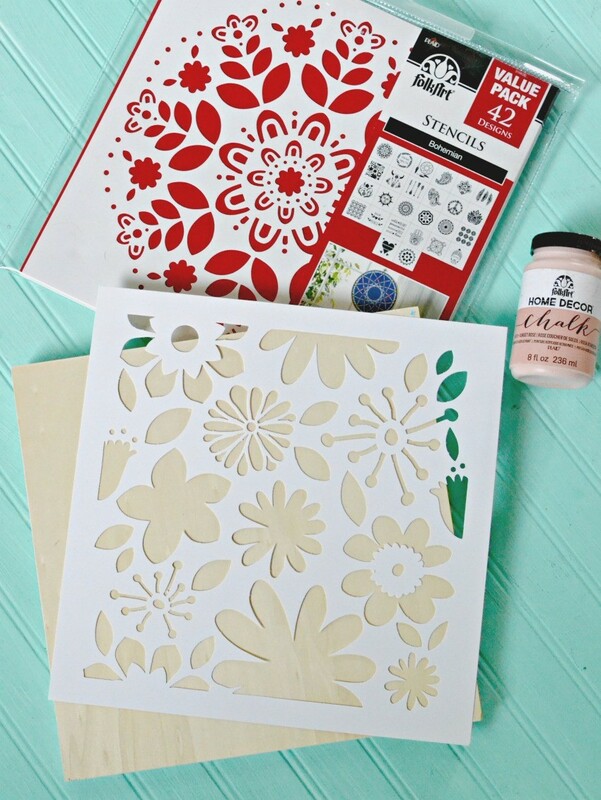 For this you will use the FolkArt Bohemian Stencil and the Plaid Crafts 12″ Wood Canvases. 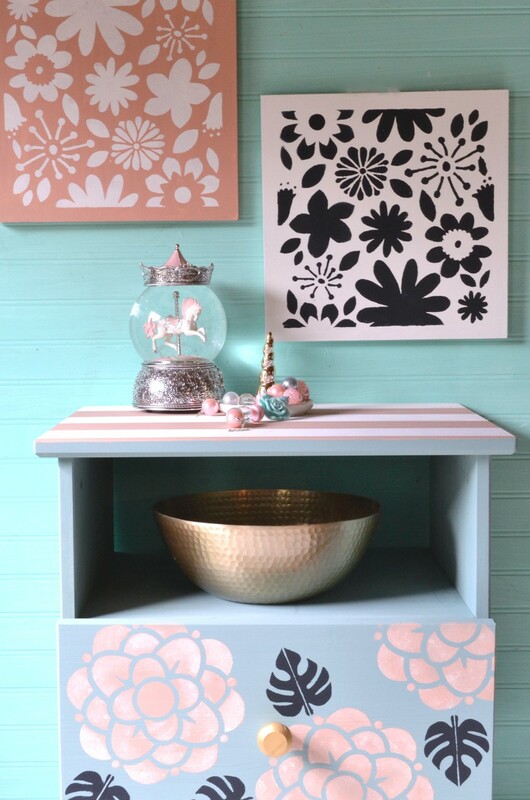 I painted the base of one with the FolkArt Home Decor Chalk Paint in Rose and I painted the other with the FolkArt Home Decor Textured Chalk Paint in Whisper White. I painted the Rose sign with white chalk finish paint on top and the White sign with the navy blue combination (Presidential + Jet Black) color I created. The signs were SUPER simple and a very fun addition to my whole vignette! 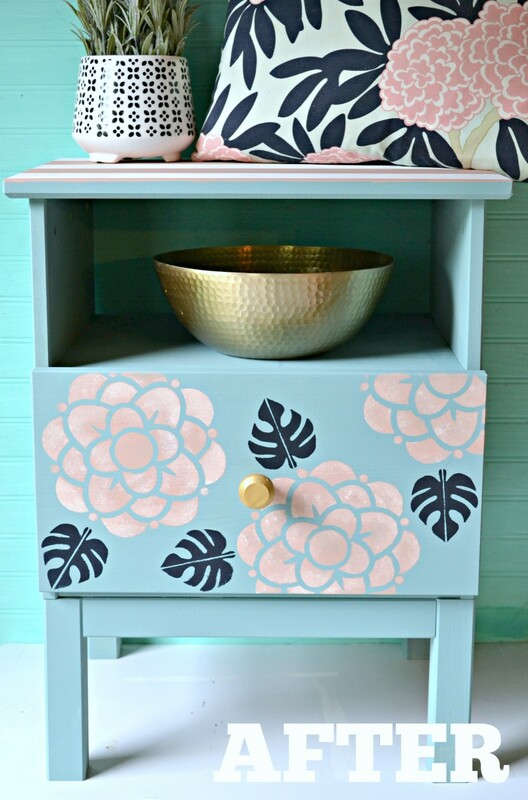 As you can see, with a little effort you can create a gorgeous, custom piece of furniture for your home in any colors, patterns, or themes that you choose!! 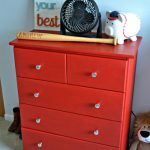 Check out my fellow creators projects below using the same Ikea Tarva Nightstand!! 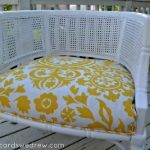 Cane Chair Makeover & Craft Room Sneak Peek! 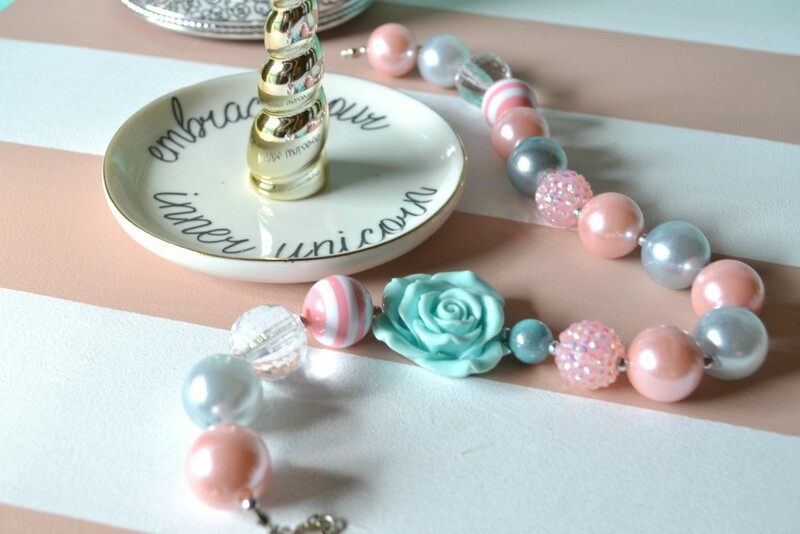 Love the color combination! I’d never heard of Caitlin Wilson before…I’ll have to check out her stuff!